Recently, the Professional cloud plan was enhanced with Records Management (Lists), a tool to hold and display structured information. 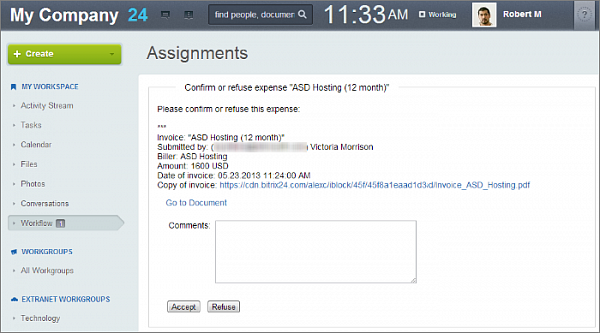 So it could be used for glossaries, structured storages, partner lists, expenses, etc. filters, sorting, column display, group editing, export, etc. 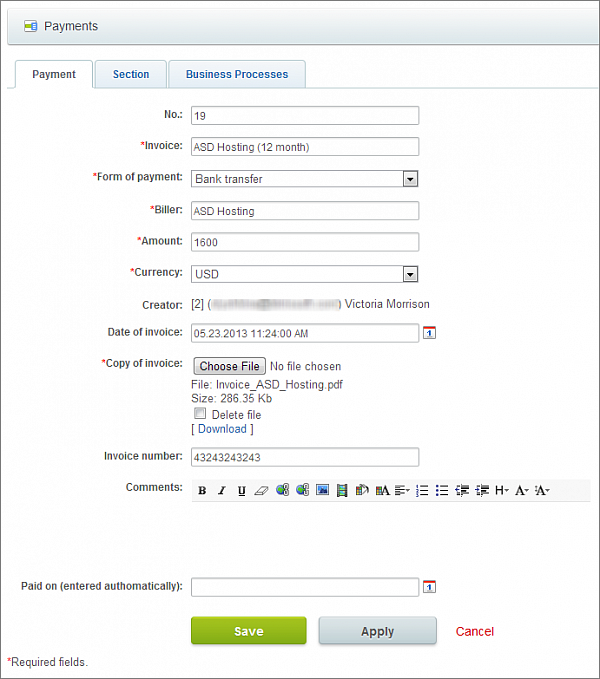 This post provides an example of approving expenses using records management and a business process. Let’s presume that the intranet contains a workgroup that is working on the development of a new website and the workgroup is named New company web site development. We will need to involve 3rd-party organizations for site design, hosting or software support. 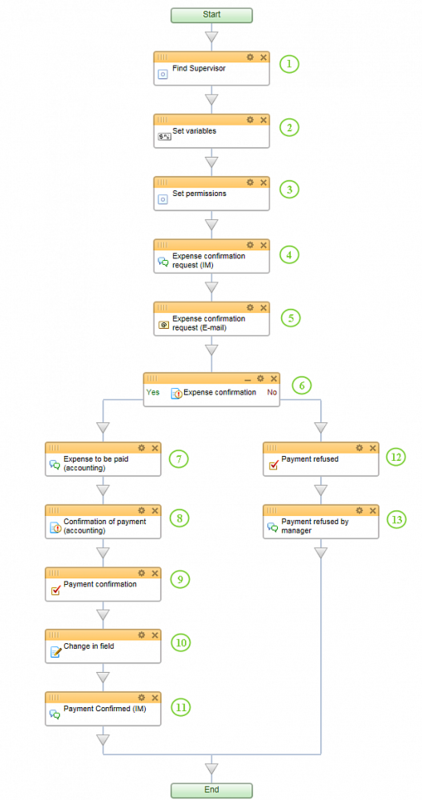 All of these payments for services by third parties (expenses to be paid by our company) can be saved in a list in the workgroup. 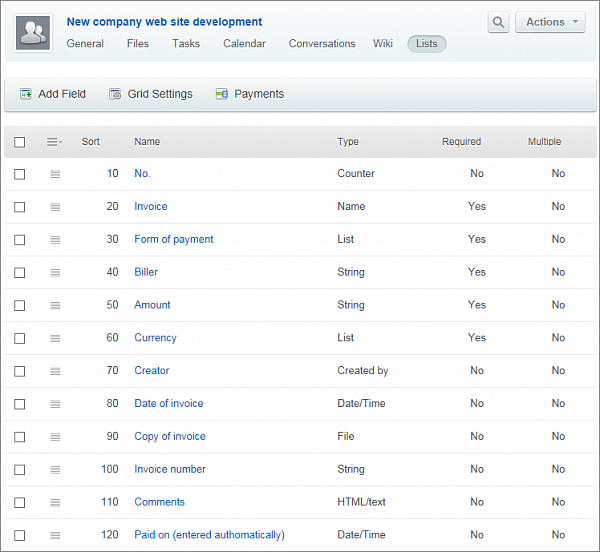 So, we create a list called Payments and each record will be an individual invoice created by a group member. The Business Process (BP) will request approval of the expense from the supervisor of the author (user who enters the payment record) and then ask the accountant to make payment. I will not go into detail concerning how to create the list and its fields. That process is described in our training course. 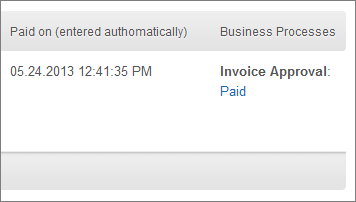 Now we’re going to build a business process for approval, processing and payment of expense requests. 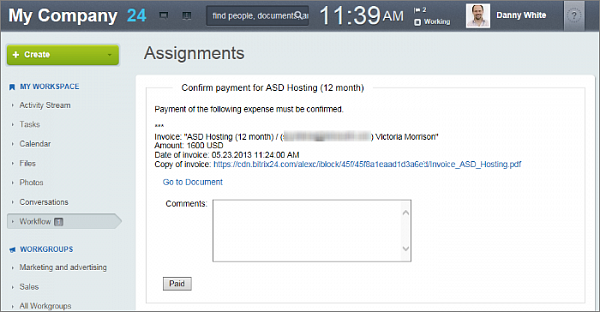 When an expense item is added to the list, the supervisor of the employee who added the expense will be asked to accept or refuse it, and payment will be processed by the accounting department. 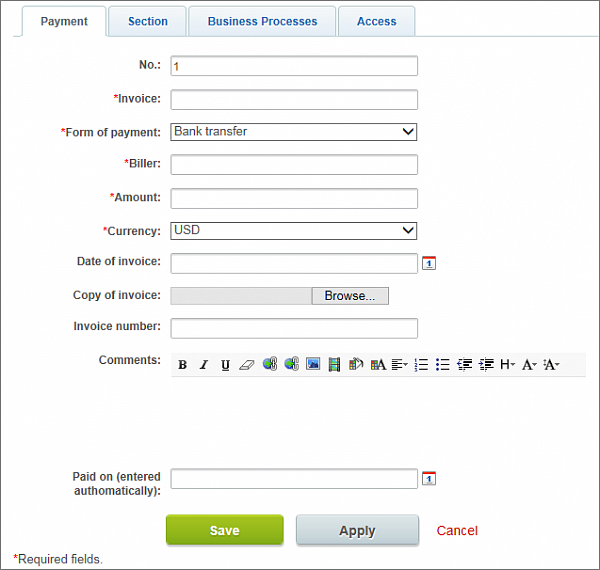 We go to business processes for the Payments list. So, I will now create a new sequential business process. Now we fill in the main template settings. 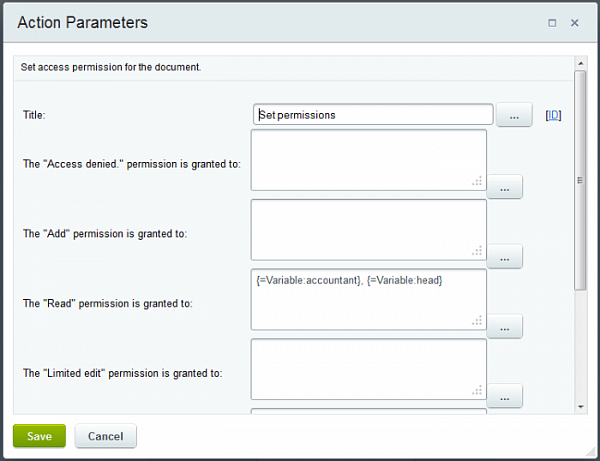 For this process, we will not need to add any parameters, since the fields in the list already serve this purpose. The variables which will be used in the business process are set. The variable Accountant, is the accountant which will effect payment of the invoice. 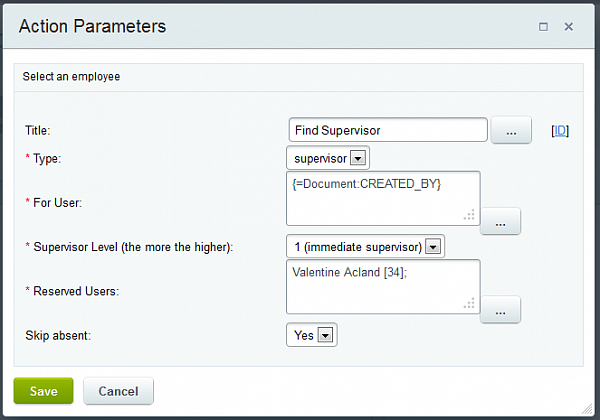 The Head variable is the supervisor of the employee; this is determined by the BP itself. 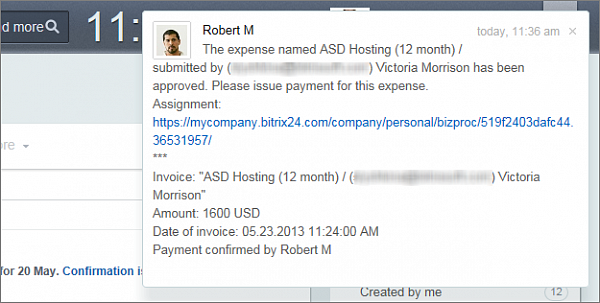 The Domain variable is wh ere the domain of the Bitrix24 intranet is stored, for example: mycompany.bitrix24.com. 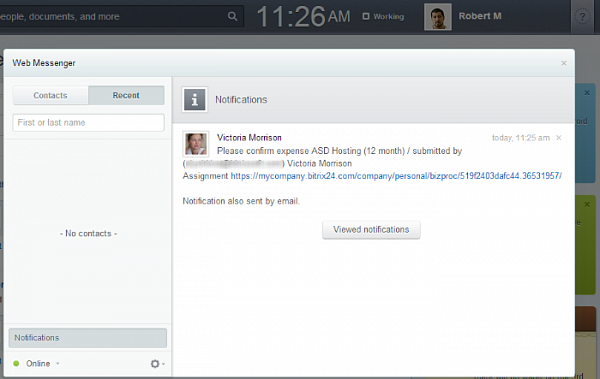 This will be used to build links to the given BP that will be sent out in notifications. 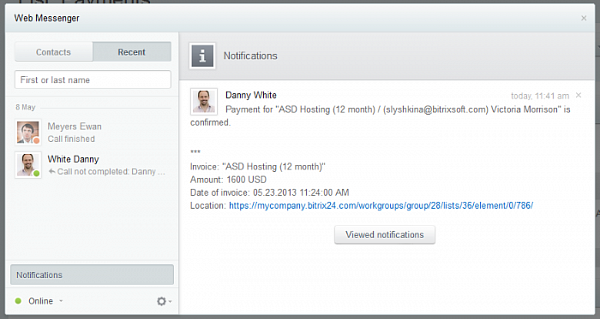 The last variable, Link to invoice, will be a link to a list inside the group, for example, https://mycompany.bitrix24.com/workgroups/group/28/lists/36/element/0/, as well as for building links to the invoice inside messages and notifications sent by the BP. 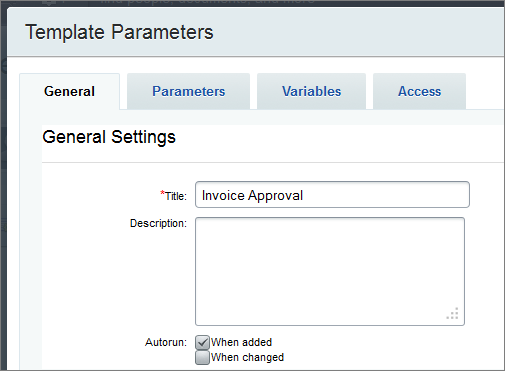 After assigning the template parameters, we go to the construction of the business process. (1) Determination of the supervisor of the employee who added the new invoice. (3) Providing ‘read’ access rights for the Head and the Accountant to the record. I’m not going to describe the details of the configuration of the blocks in the flowchart. You can download this template and import it into your Bitrix24 and familiarize yourself with it. A user fills out the expense request form. A message is sent to the manager. The manager, Robert M, opens the link to the form and accepts or refuses it. If the request is refused, the author (Victoria Morrison) is informed by instant message, otherwise the accountant receives a message that an expense needs to be processed and a link to the request. After payment is effected, the accountant confirms it in the BP. Here, the status of the expense in the list is updated. After payment confirmation is made, the author receives notification. This ends our story about creating business processes for lists. If you are trying to create a business process and encounter difficulties, please contact our helpdesk.